This "Portiere Medieval Unicorn" tapestry shows a detail from the series of medieval tapestries which is known as the Lady and the Unicorn. One of the most loved works from the Middle Ages in France, this work shows the elusive unicorn holding the pennant bearing the family crest of the le Viste family, whom was thought to have originally commissioned the work from Flanders, based on illustrations from the 15th century from France. Jean le Viste was a nobleman of King Charles VII. 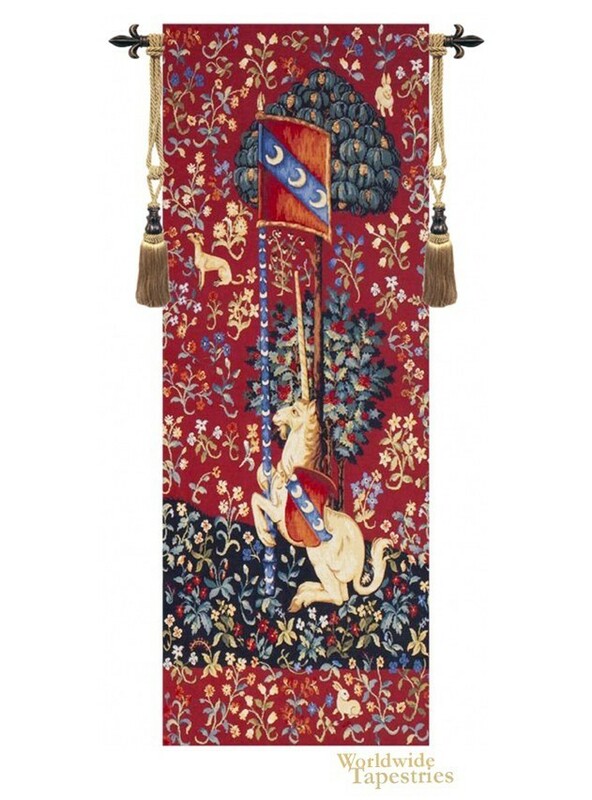 This unicorn tapestry "Portiere Medieval Unicorn" is backed with lining and tunnel for easy hanging. Note: tapestry rod and tassels, where pictured, are purchased separately. Dimensions: W 27" x H 73"